WHAT IS A HERNIATED LUMBAR DISC? A herniated lumbar disc is the result of the degeneration of an intervertebral disc, which consequently loses its elastic properties. Intervertebral discs are fibrous structures that act as pillows between each two vertebrae, cushioning the movements of the spine. Several diseases, trauma or even age can cause these discs to lose their elasticity, thus becoming more susceptible to fragmentation. When all or part of the affected disc slides out of its normal location, normal nervous structures, namely spinal cord and its nerve roots, may be compressed, causing symptoms such as low back pain spreading to lower limbs (sciatica), feeling of numbness, weakness in one or both legs, or, very rarely, alterations to bladder and bowel control. Depending on the degree of damage to the annulus, the outer layer of the disc, and on the degree of displacement of the discal material, the patient may suffer from a prolapsed disc, a disc extrusion or a sequestered disc. Diagnosis is made based on clinical and neurological examination and confirmed by neuro-imaging (CT, MRI) and sometimes neurophysiological (EMG) tests. Surgery is recommended depending on the specific characteristics of that particular patient, on their clinical evolution and on the outcome of the diagnostic tests, and only when conservative treatments, such as rest, mediation, rehabilitation, and change of activities (if possible), have failed. In fact, 2 out of 3 patients with a herniated disc do not require surgery. In the majority of cases, the aim of surgery is to cure; but occasionally it only aims at stabilising the symptoms and relieving the pain as much as possible. Patients that have had surgery once may require in the future new operations on the same or on other levels of the spinal column. All surgical procedures to treat herniated lumbar discs involve a discectomy, i.e. removing the degenerated disc or its migrated fragments, and require usual preoperative studies, such as chest X-rays, ECG and blood tests. Surgery is carried out under local or general anaesthesia, depending on the particular case and general condition of the patient. The removal of the degenerated disc or its migrated fragments, and the consequent release of the compressed nervous structures, can be performed using a variety of techniques, with ranging aggressiveness and suitability depending on the type of hernia, of the patient’s morphotype and weight, and of their activities at work. 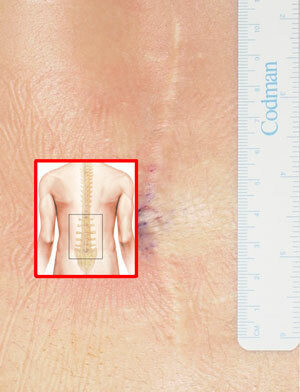 Formerly, an 8-10cm incision was performed, through which the spinal cord and its roots were accessed and through which the bit of degenerated disc and the rest of the soft part of the disc (nucleus pulposus) were removed. Over the years, the microscope was introduced, reducing the size of the incision to about 3cm. Later, the endoscope appeared and allowed the incision to be further reduced to 1.6cm, thus also reducing surgical aggressiveness and leading to a quicker and full recovery. However, it must be remembered that discectomy removes the leg pain but not the low back pain, which will reappear over time and will require other surgical procedures. The problem becomes more complex when the patient is heavy or has a job that demands heavy lifting or intense physical exercise. An alternative is percutaneous techniques, such as laser microdiscectomy or nucleotomy, which allow the limited removal of the discal material and are therefore recommended primarily for small, contained prolapsed discs. Ozone, which is effective in some cases, can also be applied. Another option is the transforaminal endoscopic microdiscectomy, where the degenerated disc or its migrated fragments are removed laterally instead of using a posterior approach. In expert hands it gives excellent results, but hypertrophy of the facet joints or a foramen stenosis make it unsuitable, and it is extremely complicated for the L5-S1 disc, especially if the iliac crest is prominent. The risks are those of any surgical procedure: reaction to anaesthetic, infection, haemorrhage. The patient’s previous illnesses will condition the postoperative recovery and subsequent evolution. Intra-operative or postoperative complications may appear, and though they are very rare, they may be severe: nerve root damage, swelling of the disc (discitis), deep wound hematoma, cerebrospinal fluid (CSF) leak, and, very exceptionally, spinal cord injury, injury of the great vessels of the abdomen or ureter injury. 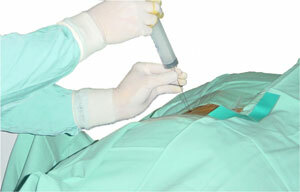 The presence of sequelae depends mainly on the condition of the patient before the operation. If the patient showed loss of strength or long-term alterations in bowel and bladder control before the procedure, they do not usually recover completely; but they do, at least, stabilise or even improve in many cases (though not in all). After a discectomy, the patient usually stays a while in the area of post-anaesthetic recovery to wake up, and then returns to their room. Hospital stay is usually 1-2 days, during which the patient will receive receiving daily care regarding the surgical wound, medication, postural changes vital sign monitoring and beginning of rehabilitation (where appropriate). Usually, the pain in the leg will diminish or disappear after the procedure, leaving only the temporary discomfort due to the surgical wound on the back. This discomfort is smaller when the wound is smaller, so a little wound will lead to a quicker recovery. Usually, it is possible to get up from bed a few hours after the procedure, once the effects of the anaesthetic are gone. Occasionally, the leg pain may persist or even get worse, but this is usually temporary and will subside with bed rest and the appropriate medication. Patients can usually resume normal activities a few weeks after the procedure, doing it gradually and avoiding significant physical efforts as well as bending forward, e.g. making beds. Occasionally, medical treatment will have to be continued and a rehabilitation program followed.